Located in the tourist haven of Anjuna & Vagator, The Nest combines tranquil settings with ease of access to all the attractions. You wake up to birdsong & natural light, and within minutes you can be on the beach or at a bar. 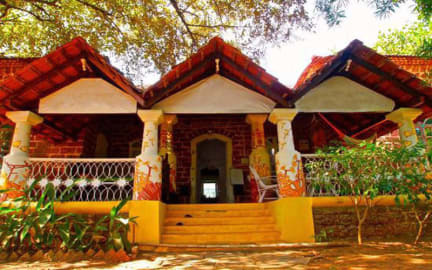 Just 2km away from Goa’s well-known Anjuna and Vagator beaches, The Nest is a renovated 150-year-old Portuguese villa, situated within a 12,000 square metre forest, thereby offering you the opportunity to get close to nature in a forest environment. We do have organic vegetables farm for our daily needs. The Nest aims to be a quality name in accommodation. Our rooms speak for themselves, with simple elegance and a light touch that ensure all comforts with just the right amount of extras thrown in. There is ample parking space, and access from the main road is easy. We have dormitories & private rooms, all of them with bathrooms inside. So, solo backpackers as well as couples can feel at home. Our ideal location means that you can be on the beach or at the bar or at the famed Anjuna flea market within minutes. If you got time on your hands you can also easily reach the more pristine & quieter beaches. Convenience stores and supermarkets are also nearby. We are nestled in greenery! But you are never far from civilization. There is a cafe and a restaurant nearby at walking distance. All the other major spots are just a few minutes away on a motorbike or by car.